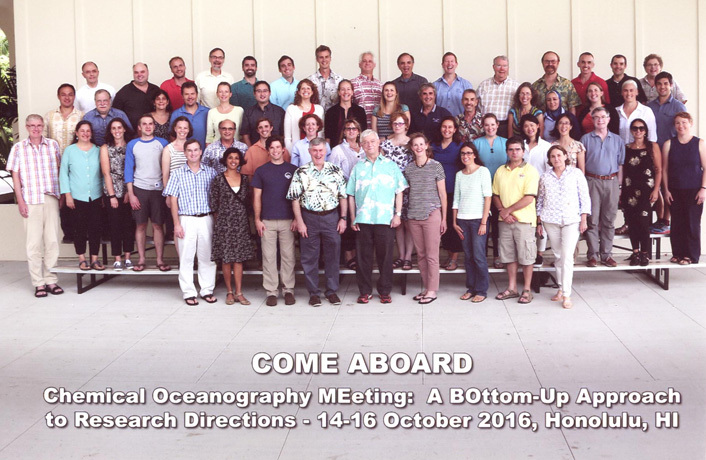 Jay Brandes was an invited attendee of the NSF-sponsored “Chemical Oceanography Meeting: A Bottom-Up Approach to Research Directions (Come Aboard)” in Honolulu, Hawaii, October 13-17. The conference was held to commemorate the 25th meeting in the Dissertations In Chemical Oceanography (aka. DISCO) meeting, also held at the same location. Jay was a prior attendee of the 1996 DISCO meeting, and was selected as the representative of his class. DISCO meetings offer a select group of newly-minted Ph.D.’s the opportunity to meet with their fellow peer group and with funding program managers to network and to learn about what each agency (e.g. NSF, NOAA) looks for in a successful grant application. This year’s meeting was extended by one day to overlap with the COME-ABOARD meeting to allow for further networking and discussion of the possible future directions of research in the field of chemical oceanography. A report summarizing these discussions is to be published in a peer-reviewed Journal next year. Jay is a member of the writing team for this summary report, and is focusing on the communicating science section. This entry was posted in Marine Science, Oceanography, Research, Science, Scientific Research, Skidaway Institute, skidaway scoop, University of Georgia and tagged chemical oceanographty, chemistry, dissertations in chemical oceanography, hawaii, oceanography, skidaway institute, university of georgia. Bookmark the permalink.